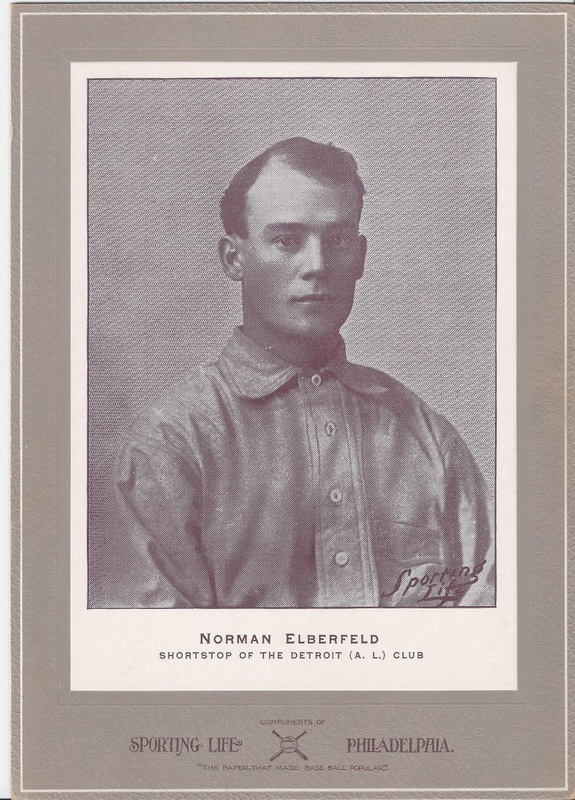 DETROIT: This scan was sent me by Chad Metcalfe: I was cleaning out a storage unit from a relative of mine who passed away who was a big collector and I found the Detroit card from the 1902-1911 Sporting Life W600. Its in amazing shape and has the original glassine envelope. These cards were produced and sold by the Sporting Life newspaper in Philadelphia between the years of 1902 and 1911. These cabinet cards measured 5 x 7 1/2 (inches). These are black and white photographs mounted on heavy cardboard mattes. The players name, position and team (league) are noted along the bottom. The backs of these cards are blank. These cares were originally giving away for three two-cent stamps and a coupon found in the Sporting Life newspaper. Later there were offered for sale at 10 cents each or 12 for a 1 dollar. The estimated cost for a Kid Elberfeld cabinet is $3,000. Possible description - no Detroit name on shirt - but definitely Sport Life. Might be photo from the magazine? Presented is a magnificent collection of sixteen different 1902-11 W600 Sporting Life cabinets, all featuring "New York A.L. Club" (Highlanders/Yankees) subjects. The significance attaching to the assembly of this collection cannot be overstated. It would be virtually impossible to duplicate a gallery of this concentrated magnitude and quality. Even though Jefferson Burdick assigned these impressive premiums an American Card Catalog designation of W600, they should actually be considered "M" cards: the cabinets were offered as premiums to the subscribers of the Sporting Life newspaper. They were initially awarded to collectors in return for coupons that were found in the newspaper, plus return postage, and later on they were sold outright for ten cents apiece. Unlike other cards from the era, new discoveries of Sporting Life cabinets are very rarely found in groups exceeding a couple of pieces. This is due to the fact that the consumer had to make a concerted effort to secure them (as opposed to inadvertently acquiring the items simply by purchasing a certain product). These thick-cardboard cabinets measure 5-1/4" x 7-3/8" and rank among the most striking and beautiful cards ever made. Each piece can literally stand on its own as an individual display piece! The magnificent portraits were all taken by Carl Horner, the most acclaimed baseball photographer of his time. Many of the images will look familiar to collectors, as they were used in a multitude of issues—including the T206 White Border set of 1909-11. The cabinets were issued in a variety of styles and over a number of years (1902 through 1911). Most cards depict their subjects in uniform, but some are captured in their street clothes; these are considered additionally scarce. The Yankees' line-up here offered, which is highlighted by four Hall of Fame subjects, includes: John Anderson/Outfielder (VG/EX), Walter Beville/Catcher (EX/MT), Harold Chase/1st Baseman (NM), John Chesbro/Pitcher/Street Clothes (EX/MT),William Conroy/3rd Baseman (EX), Norman Elberfeld/Shortstop (VG/EX), David L. Fultz/Outfielder/Street Clothes (EX/MT),Clarke Griffith/Pitcher (EX), Frank Hahn/Pitcher (VG), Harry Howell/Pitcher/Street Clothes (NM), William Keeler/Outfielder (EX w/ink notation "1906" on back), John Kleinow/Catcher (VG/EX), Herman McFarland/Outfielder (EX/MT), John O'Connor/Catcher (EX/MT), Jesse Tannehill/Pitcher (EX/MT), and James Williams/2nd Baseman/Street Clothes (EX/MT). It must be noted that this is an especially high grade collection, with all cards presenting very nice eye appeal. Also included are nine original glassine envelopes (about VG to EX with a couple lesser), each of which once housed a single card; these envelopes are very delicate and extremely scarce. This is an incredible and amazing array, and the ultimate cornerstone for a comprehensive tribute to the Yankees' foundation era. Estimated Value: $30,000 - $40,000.